Beau Riley has had the biggest win of his career, when he won the Victorian Production Sedan Title at the Bairnsdale Speedway on Saturday night. The West Australian, travelled to the venue in the lead up to the National Title, claiming victory on the last lap of the thirty lap A Main. Craig McAlister and National Champion, Trevor Mills, who was also the Victorian Champion, started on the front row while Riley and Wayne Bourke from New South Wales would start on row two. After being three wide through the first two turns, it would be Mills who would take control of the race, opening a gap on the field. 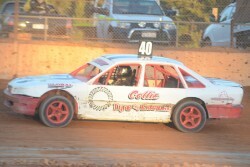 Multiple State and National Champion, Stephen Laidlaw started to make some moves, and was in fourth place, when mechanical issues saw the Victorian hit the fence in turn three, resulting in a stoppage. Mills again opened a gap on the opposition, but with a large period of racing without a stoppage, Mills caught heavy traffic, which enabled Beau Riley to close the gap. Riley showed his nose a couple of times to Mills as they weaved through the traffic, but a stoppage for a car that spun on the back straight, would lead to a five lap restart. Riley tried several times to pass Mills in the concluding stages, getting a final opportunity with a lap to go, passing Mills on the inside, heading into turn one. That was enough for the driver from Collie in Western Australia to take the win, with Mills second and Craig McAlister third. McAlister was strong all night, and was in the top three throughout the thirty laps, with Justin Hawkins, Adam Wilson and Stephen Aldridge completing the top six. For Riley, it is his first ever State Title win, despite being close previously, and his fifth Feature race win of the season.